As one of the largest employers in Diss, leading technology company Midwich is delighted to continue its support within the local community by sponsoring the Diss Cyclathon for the third consecutive year. The aim of the event on Sunday 23 June 2019 is to encourage more local people to cycle this summer and to raise vital funds for Midwich’s chosen charity, Norwich & Central Norfolk Mind. The event hopes to top last year’s total of 1,000 riders and £10,000 raised for charity. 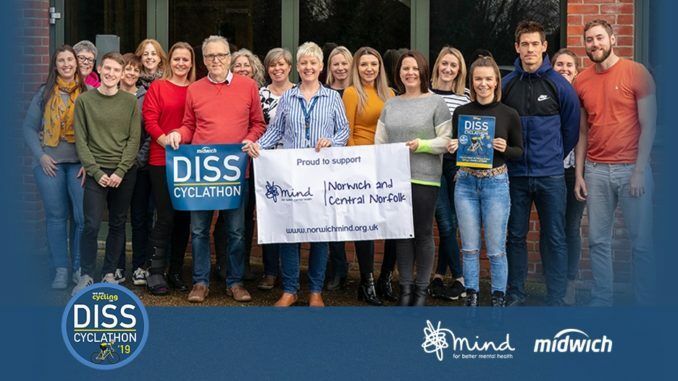 Sarah Ingram, fundraising manager, Norwich & Central Norfolk Mind, added: “We are absolutely thrilled to be the chosen charity for the Diss Cyclathon this year as well as the charity partner of Midwich. Our mental and physical health go hand in hand and exercise can play a big part in someone’s recovery. We believe no one should have to face a mental health problem and we work hard to reduce the stigma associated with mental health, support people in their recovery and champion better services for all in our community. “A further thanks to the Cyclathon for providing 10 free places to the Mind staff so we can the reap the benefits of this great event. We’ve also collectively pledged to fundraise a £1,000 between us”.